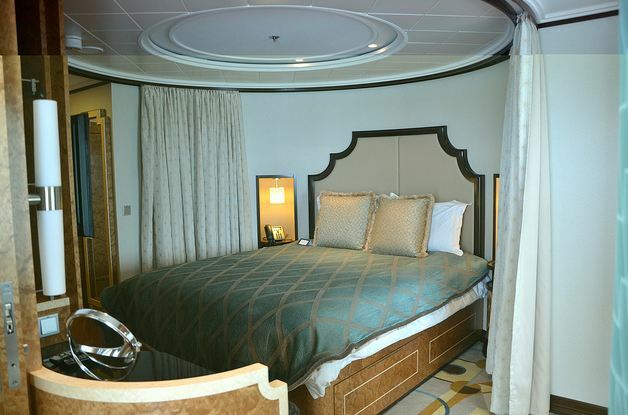 Alone on the Disney Dream 3 - Pixie & Pirate Destinations *|* Wishes become memories. One dream at a time. _We last left Lisa R in part 2 of her "Alone on the Disney Dream" ready to explore the pool deck. She's back for part 3 and has great information and pictures to share. During my "Alone time" on the ship I wanted to see something special. Something I know I will never see as a guest. 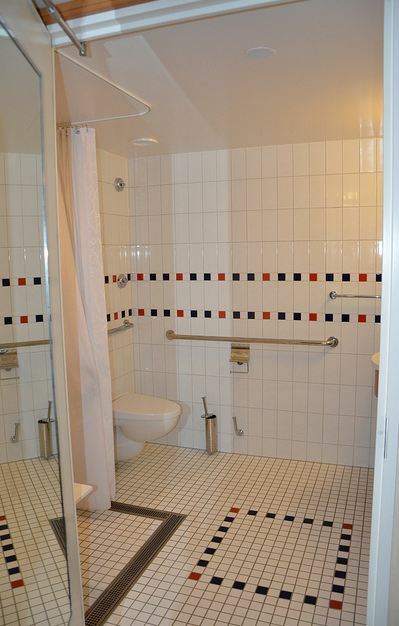 The Walt Disney Suite. Let me tell you when I say amazing, I mean AMAZING! What I wouldn't give to spend a cruise here. 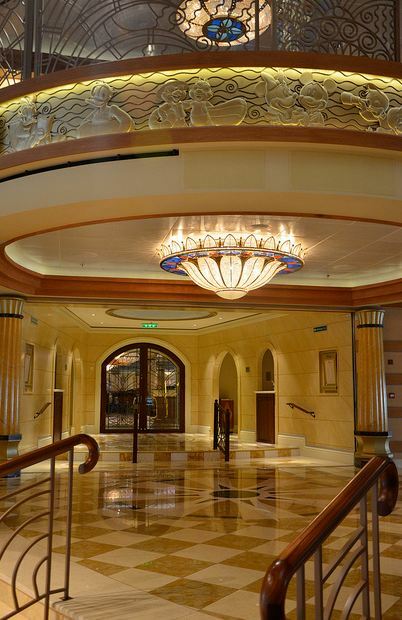 The Walt and Roy Disney Suites (or the Royal Suites as they are also known) are located on Deck 12 Forward. 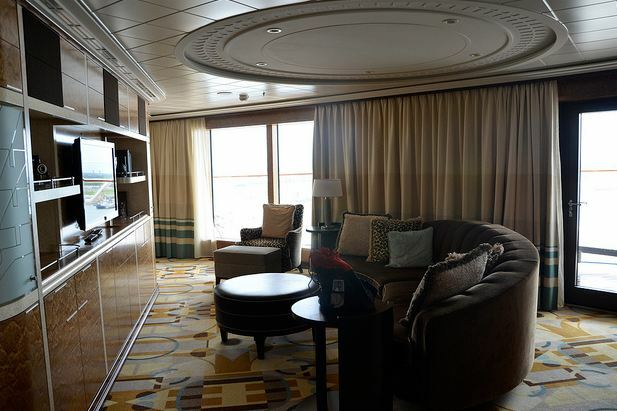 In addition to a host of upgraded amenities, a Concierge Royal Suite with Verandah has some additional features. They sleep 5 guests and are around 1780 sq. ft if you include the verandah. 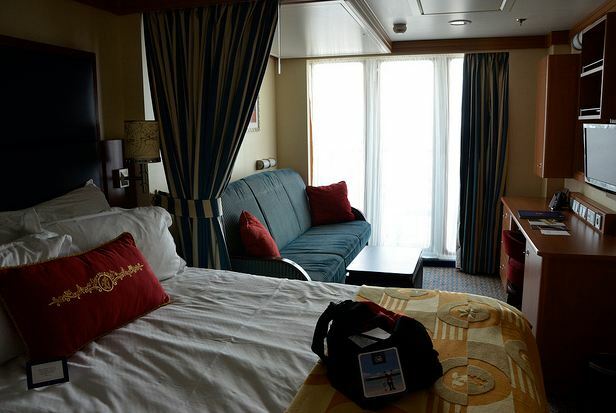 _After ducking into all of the different rooms and exploring the ship we headed to our room to relax before the Lifeboat Drill. Here are some pictures that I took throughout the week along with some information about these areas of the ship. 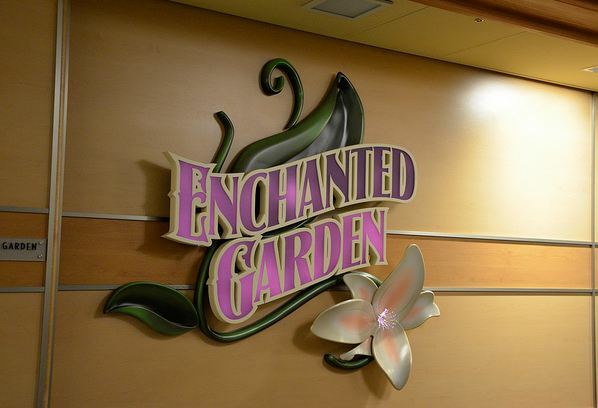 Enchanted Garden - Enchanted Garden casual restaurant is inspired by French gardens and features a dining environment that transforms from day to night. During dinner, the sky overhead first becomes a sunset, then changes into a twinkling field of stars. Royal Palace - The Royal Palace is an elegant restaurant featuring the classic Disney films "Cinderella", "Snow White", "Beauty and the Beast", and "Sleeping Beauty". 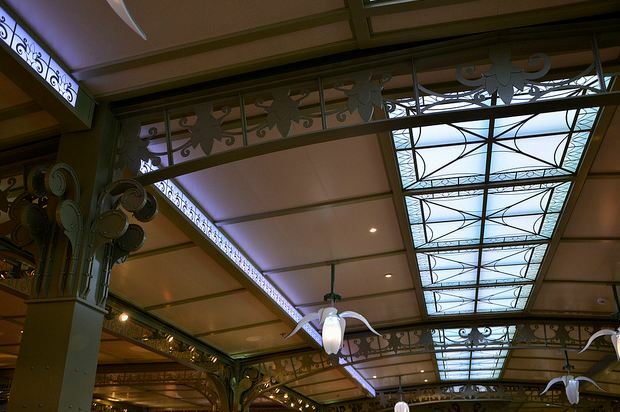 The décor includes a hand-blown chandelier made of glass slippers. Decorations include elements from each fairy tale. 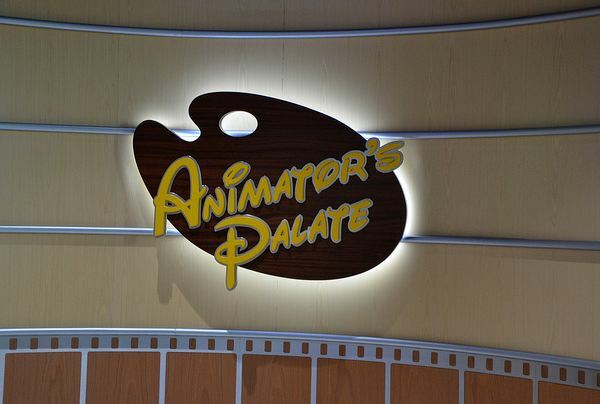 Animators Palate - Animator’s Palate is a restaurant that brings the magic of Disney animation into the dining room for a one-of-a-kind experience. The restaurant is filled with character sketches, paint brushes, film strips and other Disney and Pixar odds and ends. 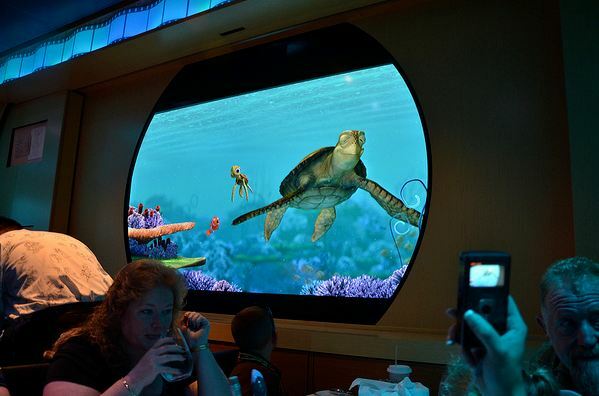 The star of this restaurant is Crush from Finding Nemo. 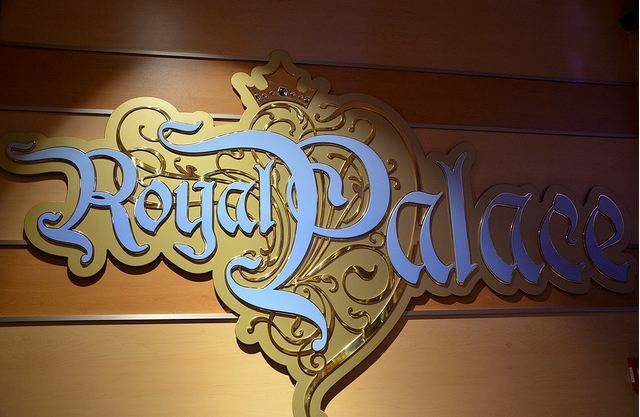 Palo - Palo is the adults-only restaurant on the Disney Dream. 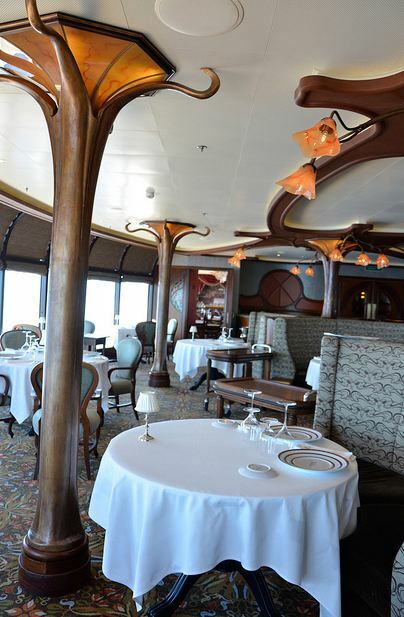 The romantic dining room features breathtaking ocean views, rich decor and excellent cuisine. 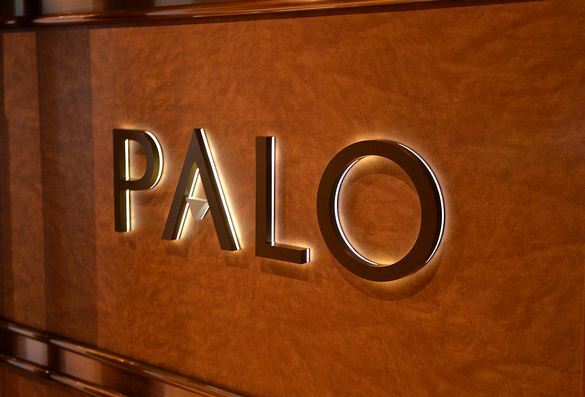 Named after the colorful poles that line the canals of Venice, Palo offers a memorable dining experience in an upscale atmosphere. Do not miss the Brunch. 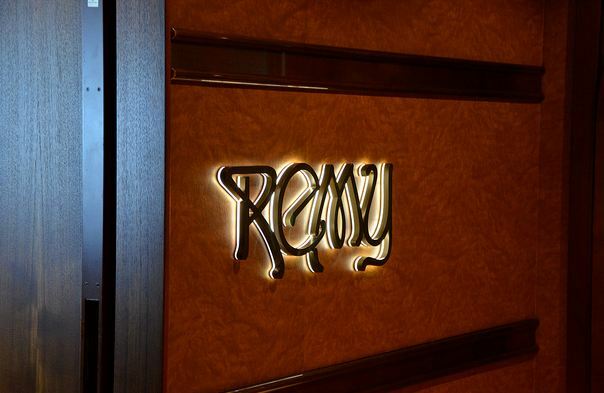 Remy - Remy is Disney's first premier dining experience, featuring gourmet French cuisine. 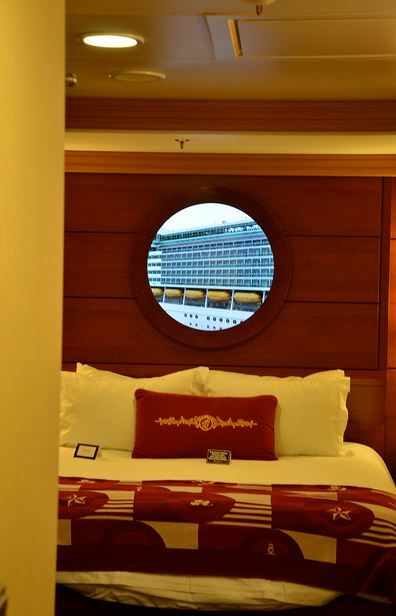 Located next to Palo on deck 12, Remy also has spectacular views of the sea. 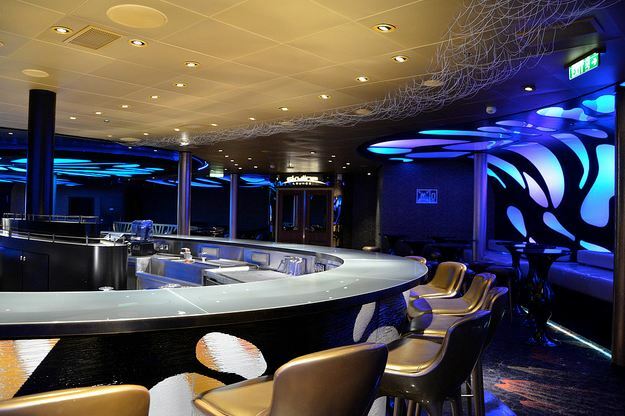 Meridian - Meridian is a quiet bar on deck 12 with amazing ocean views and easy access to Palo and Remy, the adults-only restaurants. 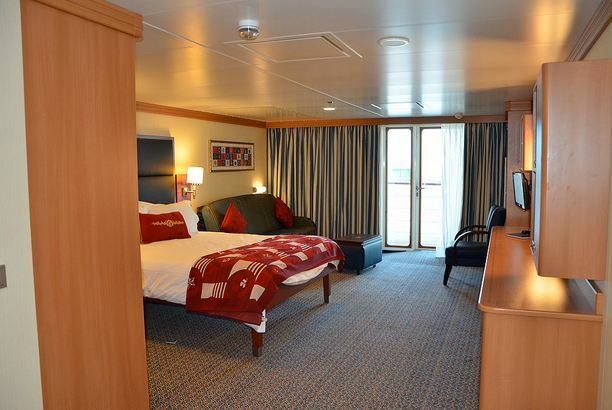 Meridian is decorated in a nautical style. The seats have buckles to resemble old steamer trunks. Leather maps embossed with passport stamps from around the world are hung on the walls. 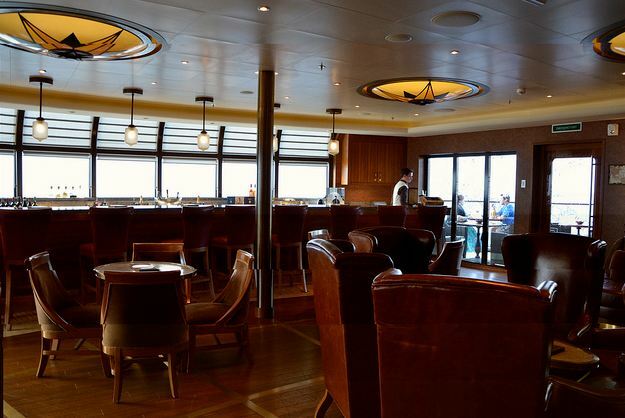 Meridian also has a great outdoor seating area and cigar bar that overlook the aft of the ship. The bar has the same dress code as Palo (dress shirt or jacket for men and dress or pantsuit for women). District Lounge - The District Lounge is the first entertainment Spot when you enter The District. This is a full-service bar and has comfortable seating. It's a good place to listen to the live piano music or other entertainment. Evolution - Evolution is the largest club in The District. It's like the nightclub of the Dream. There is a lighted dance floor that changes colors with the music. Along with dancing, Evolution is the place they host special events, like the Disney Vacation Club Welcome party. Pink - Pink is an elegant and upscale bar, a favorite place for the ladies. 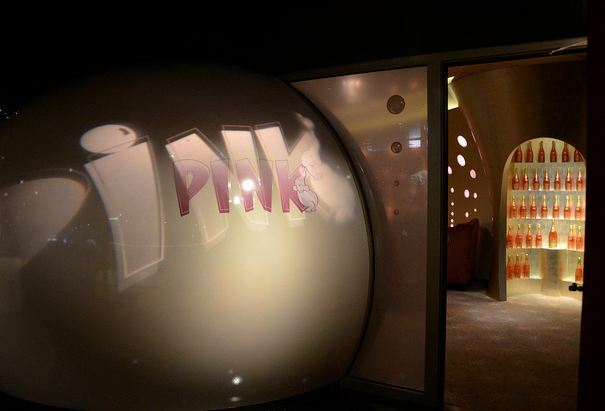 Pink has glass bubbles covering the walls. It's like being in a champagne glass! To add a touch of Disney, the famous pink elephants from "Dumbo" appear to dance in the bubbles. The bar serves champagne and other sparkling wines, but also has a full-service bar. 687 - 687 is a pub and sports bar located in the District. 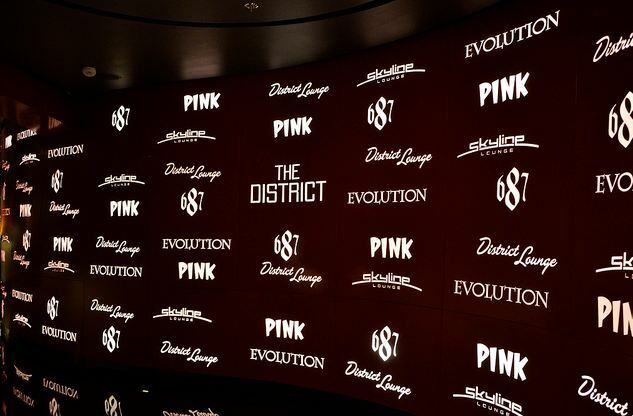 The name 687 is a reference to the "block number" of the Disney Dream, the vessel number assigned by the shipyard and denoted on every block and every piece of steel used to build the Disney Dream cruise ship. 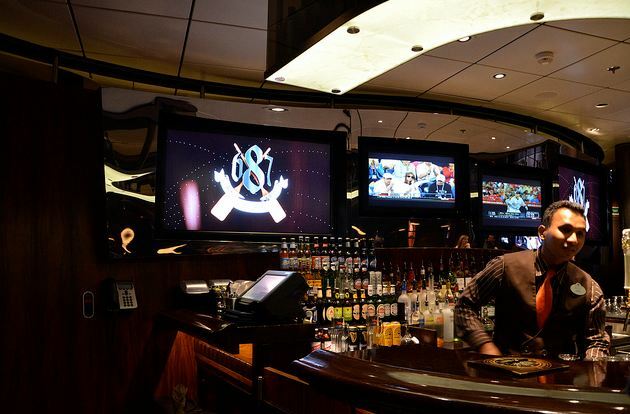 687 is a great place to watch live sports or major events on one of the many televisions, one of which is 103 inches wide and has digital surround sound. 687 has a wide range of international and domestic beers as well as a full selection of wines and cocktails. The pub even has its own beer, appropriately named "687", It got the seal of approval from my beer loving husband. 687 also offers its own special cocktail, The Shipbuilder, made with grappa, limoncello, pear vodka, agave nectar, and freshly squeezed lemon juice. It received thumbs up from me! Skyline - Skyline is full-service bar that shows world's most famous cities, including Paris, Rio de Janeiro, New York, Chicago, and Hong Kong, thanks to the use of LCD screens. On the Disney Dream cruise I was on, this bar was empty every time we came in here. It is very romantic and a great quite place to snuggle with your honey and have a drink. The skylines change transform from day to night. Each city has its own signature cocktails. They also have the neatest light up menus. D Lounge - The D Lounge is like a huge family room and is fun for the entire family. 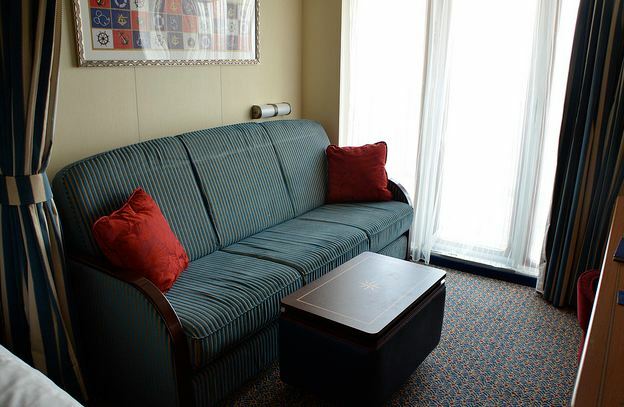 The D Lounge seats 350 guests and has all sorts of "game night" entertainment in the evening. Throughout the day, D Lounge offers about 20 activities for specific ages or interests as well as for whole families. This is a great place to meet your favorite Characters. Walt Disney Theater - The Disney Dream Walt Disney Theater stage features Disney production shows such as "Disney's Believe", "The Golden Mickeys", and "Villains Tonight!". Buena Vista Theater - The Disney Dream Buena Vista Theater shows first-run Disney movie releases and classics. The theater includes 3-D technology for newer cinemas and very comfortable seats with fold up arm rests for snuggling. 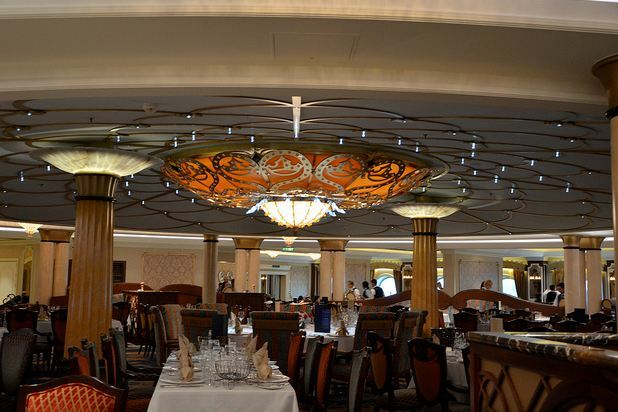 There is much much more to enjoy on the Disney Dream then I covered here. Even being on the ship for a week I feel I just did not get to see and do everything. 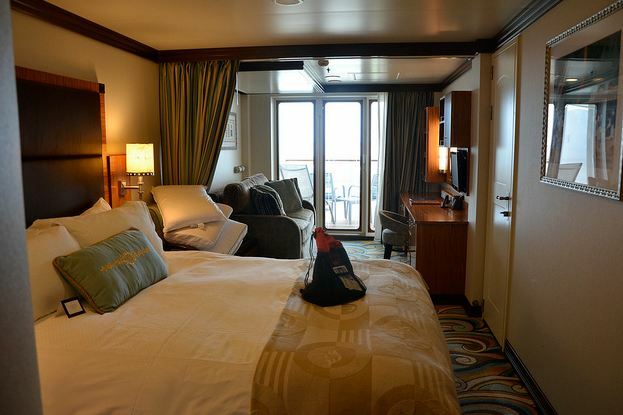 Home Port - Port Canaveral, Fla.
Staterooms - 1,250 in total with 150 Inside Staterooms (12%) and 1,100 Outside Staterooms (88%), of which 199 are Ocean view, 860 Verandah, and 21 Suites (with verandah). 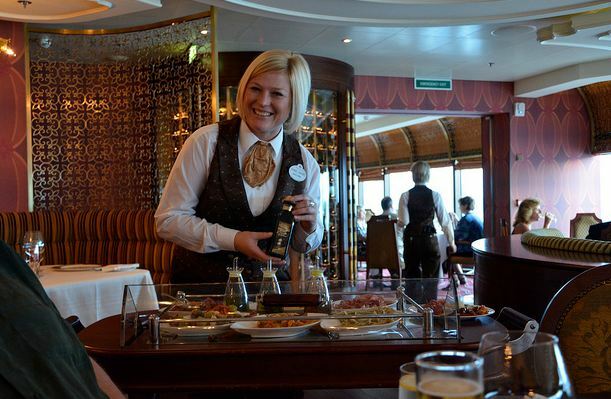 Plan your own Disney Cruise experience - Request your Disney Cruise quote today!